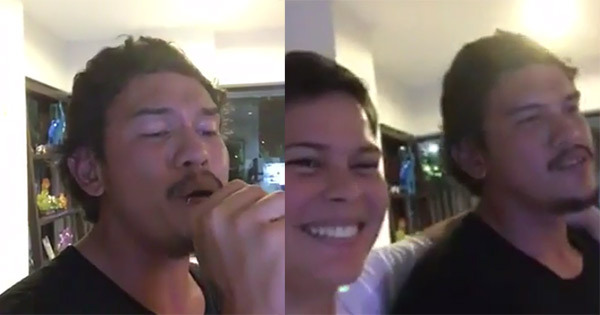 Presidential son Baste Duterte once again captured the hearts of netizens as he sings Freestyle's "Before I Let You Go" in this viral video. His sister, incoming Davao City Mayor Sara Duterte-Carpio, requested him to serenade her and everyone around using the videoke. The charming social media sensation granted his sister's request and gamely sang the love song of his choice. He said "Before I Let You Go" was perfect as he was about to leave the house. Facebook user Mil Rapinan Tranquilino posted a video of the performance, which already got more than 26,000 shares and over 1.6 million views as of 4:20 p.m. Wednesday. Baste and Mayor Inday Sara earned praises for being sweet towards each other. They were also appreciated by netizens for their simplicity.